InsightArgentina is the volunteering arm of HelpArgentina, a non-profit group founded in New York in 2002 with the fundamental mission of connecting donors and volunteers from around the world with Argentine NGOs (non-governmental organizations), selected according to best-practice criteria. Its basic premise is that people around the world are keen to get involved and invest their time or money into helping develop Argentina’s social sector, but require help and guidance to turn these good intentions into a reality. With US$1.5mn raised in funding since its foundation, the model appears to be working. By applying through InsightArgentina, volunteers are assured to team up with a reputable and established NGO in Argentina, specializing in areas ranging from health and nutrition to economic development and employment creation. With over 50 affiliated NGOs spread throughout the country, InsightArgentina is able to offer a considerable range of volunteering assignments. Placements are well structured, and begin every Monday, with a minimum commitment of one month. A flat US$450 fee is required to cover the costs of running the organization, of which US$100 is funneled directly into the project on which the volunteer participates. Helpers are offered general assistance before, during, and after the program, while InsightArgentina can also offer support in finding accommodation or Spanish classes at discounted prices, though this is not compulsory and not included in the placement fee. Online applications should be completed at least two weeks before preferred start date, though earlier notice will likely broaden the scope of available programs. This relatively new, non-profit venture seeks to exploit the mutual benefits of volunteering for the individual visitor and those that receive support. The focus of the organization is weighted heavily on providing an interesting and rewarding experience for the foreign volunteer, through combining a work assignment with Spanish classes and extra activities and uniting groups of like-minded helpers. Voluntary placements are split into twelve broad areas, which include poverty relief, women’s rights, art and development and political institutions. Volunteering through BAV is relatively expensive, with a flat fee of $800, though this includes a two-week (20 hour) course in Spanish. Further language classes are available if required and accommodation is arranged through the agency. Additional services are offered, such as booking excursions and providing a temporary cell phone, though these come at further cost to the volunteer. Applications are welcomed throughout the year, with start dates and length of stay dependent on the individual. However, given limited capacity, BAV requires at least two months advance confirmation (with US$400 deposit), and recommends that foreigners apply up to a year before their preferred start date. L.I.F.E is a not-for-profit organization seeking to promote happiness and hope for children in impoverished neighborhoods. 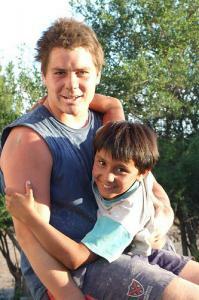 Working with community centers in the city and province of Buenos Aires (and also a Guaraní indigenous village in northern Argentina), L.I.F.E runs programs aimed at enhancing a child’s personal development through various recreational and educational activities, with an emphasis on fun and group participation. The organization also conducts informative health-related campaigns, dealing in particular with sensitive issues affecting the youth population, such as AIDS. L.I.F.E has no paid employees, meaning everyone involved in the administration and activities of the organization is a volunteer. Since 2001, the foundation has welcomed over 900 volunteers, from around 30 countries, working on the front line through organizing sports and games, cooking for the children, and teaching workshops. For longer-term stays, there are also internship opportunities, helping with the administration, research and development of the organization itself. Volunteering at L.I.F.E is an informal process and a good option for those looking for independence and flexibility. It is very much a case of turning up and helping out where, and when, you can. There are no placement fees, no minimum time commitment, and no requirement for a prior understanding of Spanish (though some knowledge would obviously be useful). The organization also has a limited number of rooms available for volunteers to rent near the office in Recoleta, with the proceeds put towards funding L.I.F.E projects. Voluntario Global considers itself a civil association seeking to promote change from the reality currently faced by marginalized families in “the other” Buenos Aires. Working out of “villas miserias” (shanty towns) in Villa Soldati and La Boca, two barrios in the south of the city where large swathes of the community live in poverty, the foundation encourages volunteers to assist in both daily essentials such as distributing food and in supporting longer-term growth in the community. Voluntario Global offers two very distinct voluntary opportunities. The one-day program is essentially an interactive excursion into the areas of work (twice weekly for both La Boca and Villa Soldati) so that foreigners can see first-hand the daily struggle faced by the city’s poorest communities. The idea is to provide an insight into how a person can contribute in one of the organization’s more extensive placements, and help them reach an informed decision on which area of aid they wish to focus. Voluntario Global is always seeking volunteers for the variety of projects it simultaneously directs, including supervising recreational activities for children outside of school hours and working on the promotion of the foundation’s mission and development of its institutional capacity. The focus of the organization is entirely on its social projects, and as such, it does not offer Spanish classes or accommodation to helpers, though can provide advice when necessary. Volunteers are not required to pay a fee, though are entitled – and encouraged – to donate either money or vital resources to the cause. In keeping with this flexible style, there are no set time commitments for helpers, though most long-term projects expect at least two working days per week from participants. The rest is up to the individual. Compromiso Solidario (Solidarity Commitment) is an initiative set up by Fundación IDEAS aimed at building closer connections between Northern and Southern hemisphere countries, as a means of reducing the inequality that still divides the two halves of the world. The foundation has over ten years experience in placing international helpers in local community projects, and offers internships and voluntary placements throughout the year, as well as a specialist training course in Development Cooperation. This includes theoretical classes and practical assignments, teaching students about Argentina’s social environment, and providing training in strategy, finance, leadership and communication in the development sector (see website for full details). Based in Córdoba, a university city around 10 hours overland from Buenos Aires, the established venture has partnered major international NGOs (including the World Bank and Inter-American Development Bank) in social development and educational programs throughout Argentina. 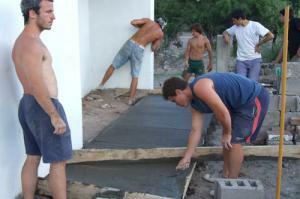 Volunteers at Fundación IDEAS are required to pay a one-off flat fee of US$480 for registration and contribution to the organization, with additional operating expenses amounting to US$73 per month (a minimum one month commitment is necessary, and volunteers are able to stay in the program for up to one year). The foundation can also offer accommodation – either with a host family or shared apartment – Spanish lessons and the medical insurance that is a prerequisite to participation in any voluntary assignment. All of these extra services will be charged to the individual. Taking its name from the huge and sparse southern region of Argentina, the Patagonia Volunteer foundation fights for the human rights of indigenous local communities and stresses the need to protect the environment. Volunteers can apply to various projects at affiliated grass-roots organizations, such as producing material to educate locals on the environmental risks associated with industrial mining, or supporting the land ownership rights of the native Mapuche community. To participate in one of Patagonia Volunteer’s programs, an applicant should have an intermediate level of Spanish (the organization can arrange for private lessons at local prices) and be prepared to work for a minimum of one month. Accommodation with a host family can be provided upon request, with volunteers paying an agreed price directly to the household. A one-off placement fee of US$370 is required, though this includes an annual membership to the Spanish-based host MAPU Association, during which time further voluntary assignments are free. Certain technical or academic qualifications are a prerequisite for some of the more specialized positions, though others just ask for enthusiasm and dedication. Patagonia Volunteers accepts online applications all year round, though advance warning of one month is both preferred by the enterprise and likely to yield more options.